Can video analytics be used to stop sweethearting and self check out theft, two of the biggest threats that retailers face? While analytics are commonly used for simple activities like people counting, reliably detecting the more complex 'sleight of hand' thefts common in sweethearting and self checkout is more challenging. In this note, we examine the offering of a provider who claims to be able to solve these problems. StopLift works with both analog and IP cameras. For analog, an encoder or encoder card is used. For IP, typically a separate connection / stream is requested from the IP camera. StopLift says they can work with low resolution analog images and that higher resolution / megapixel is typically only needed if a camera is going to cover two register stations. 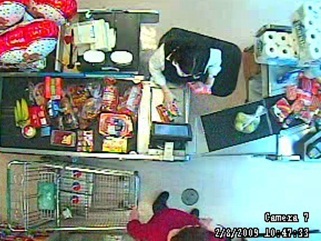 Generally, one camera is positioned over each register as is commonly done for traditional retail surveillance. Cameras should be positioned directly overhead of the scanner to achieve optimal detection. 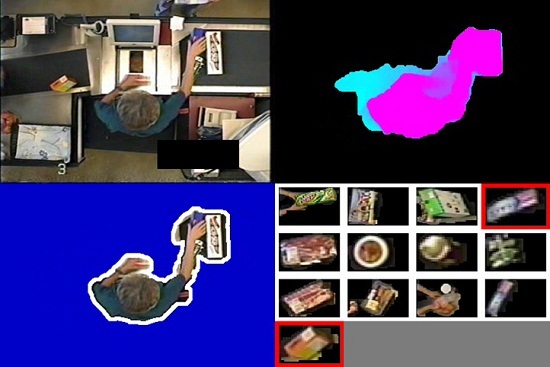 The image to the right demonstrates a typical camera view used with StopLift. A dedicated server, called the 'DVA' (digital video analyzer) is located at each location. In most cases, video is retrieved for analysis via a looped output from the local DVR, but video can be captured from the camera directly as necessary. The DVA is also integrated into the local Point of Sale system so that journal information can be referenced. StopLift does not require using their hardware and allows use of COTS servers/PCs of the customer's choices. StopLift acts independently of DVR / VMS systems and is not typically integrated into a surveillance system's user interface. The on site software acts as a 'first pass' screening to detect activity that is suspicious. Some example including multiple scans of a single product while different products are bagged, and gross mismatches between scale feedback and keyed product entry. These event are then sent via the cloud to StopLift's human analysts. How does Store LP interact with the system? 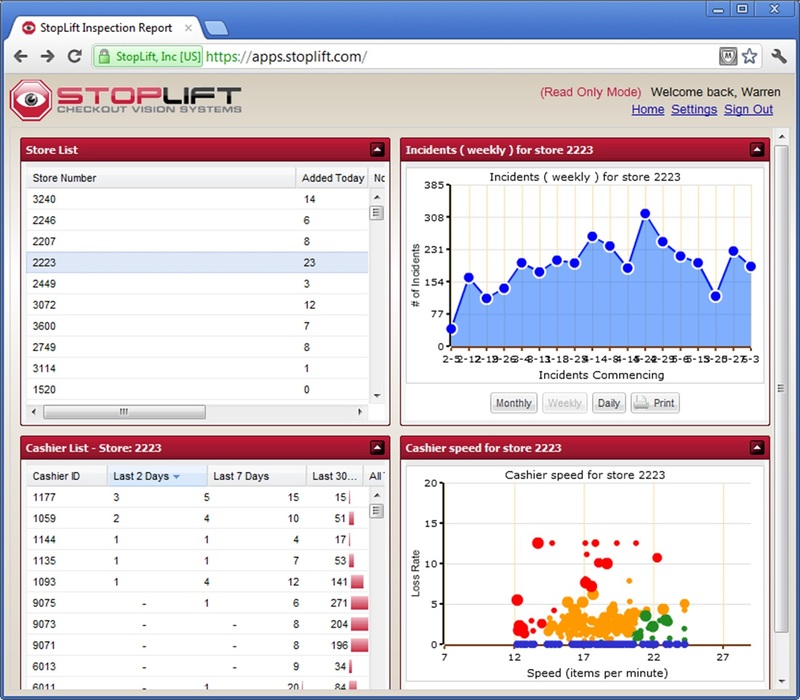 Loss Prevention personnel can login to StopLift's website to review alarm activity reports. Not only are 'sweetheart' activities reflected, other gross performance metrics like number of incidents per store, cashier speed, scan accuracy, and average performance over time are displayed. Cameras: StopLift can resuse existing cameras as long as they have the angle/view required. StopLift does not typically install cameras themselves but will provide remote support to optimize the positioning. DVA: The server/ video analyzer needs to be installed and connected locally. Remote access: The DVA server needs to be connected back to StopLift's data center. Because StopLift requires manual offsite video review, a network connection needs to be established between each store and StopLift's data center. This can be challenging as it requires coordination and approval from IT. StopLift says that typically they use a site to site VPN for secure connectivity. 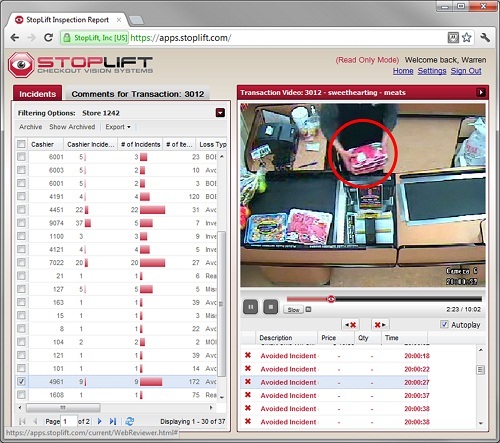 StopLift emphasizes that they are PCI complaint to help minimize retail concerns. That noted, this aspect of installation can be complex and time consuming because of IT security concerns inherent to such access. StopLift is a subscription based software/service offering bundling video analytics, human reviews, ongoing web access etc. Pricing is based on a percentage of the retailer's volume of sales. Unlike most security systems, StopLift does not charge per camera or per register. The company says that this incents retailers to use their offering across more registers and sites. We believe this is a better model for most retailers as it reduces up front cost and puts the onus on the provider to justify their ongoing value. However, since it is a negotiated percentage of sales, it is difficult to determine abstractly the ROI. As such, this likely requires on site field trials to determine value. For projects that integrators source, StopLift says they will partner with integrators and provide them a percentage of the ongoing subscription fees, which could be a desirable source of ongoing RMR. While there are a number of VMS / analytics manufacturers that offer analytics, there are not many who provide comparable services that include review and event verification. Equally important, we have not covered this segment deeply enough to offer a strong opinion about competitive value.